Benefits such as better performance of IGCT at higher temperature, (temperature ranges from -40 to 125 C) support the growth of the market. IGCT is used in industrial appliances and steel mills for controlling high power AC motors, and AC grid interface, as well as the PWM switching. Therefore, this feature adds value to drive the demand for the IGCT market. 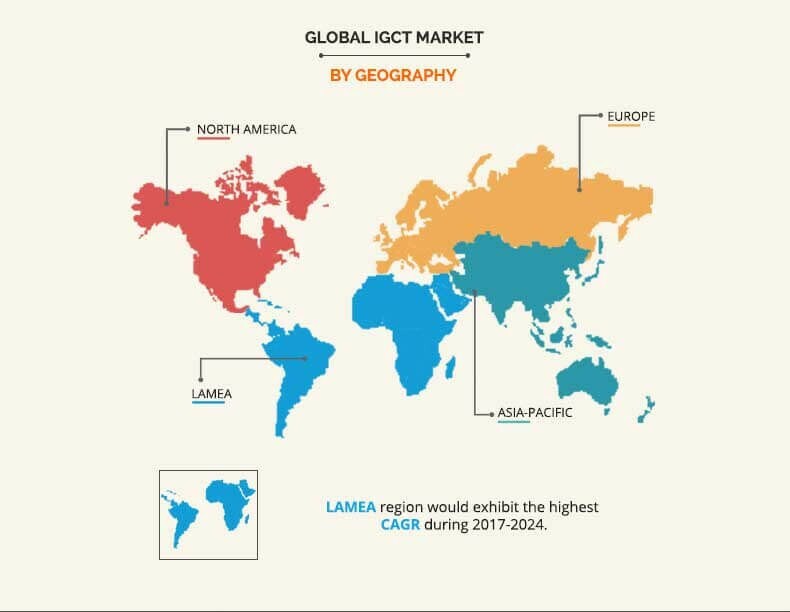 The IGCT market is segmented based on type, application, and region. Based on type, it is categorized into asymmetric IGCT, reverse blocking IGCT, and reverse conducting IGCT. The application segment is divided into drives, traction, converters, and others. Based on region, the market is analyzed across North America, Asia Pacific, Europe, and LAMEA. The major companies profiled in the report are ABB, Infineon Technologies, Mitsubishi Electric, Tianjin Century Electronics, CSR Zhuzhou Institute Co, Ltd. (CRRC), General Electric, Xiamen Hidins Technology Co. Ltd., Jiangyin City Saiying Electron Co. Ltd., AmePower, Inc., and Shenzhen CTW Semiconductor Co., Ltd.
Low conduction loss as compared to GTO and IGBT, increased usage of power electronics in renewable energy sources, better performance at high temperature, and low price are the factors that drive the growth of the market. 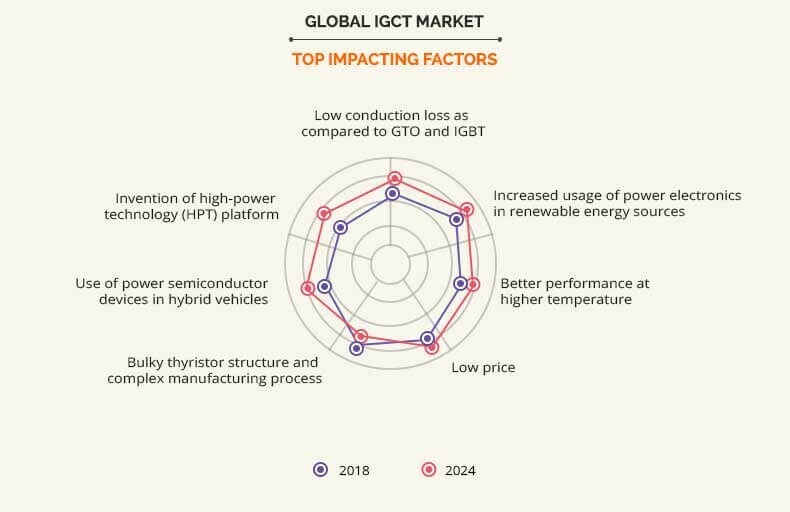 In addition, use of power semiconductor devices in hybrid vehicles and invention of high-power technology (HPT) platform, bulky structure of thyristor, and complex manufacturing process also affect the growth of the global IGCT market. These factors are anticipated to either drive or hamper the market growth. IGCT is optimized for low conduction losses. Its typical turn-on/off switching frequency is in the range of 500 hertz. However, in contrast to the Gate turn-off thyristor (GTO) and insulated-gate bipolar transistor (IGBT), the upper switching frequency is only limited by operating thermal losses. Due to this, lower conduction loss, and transition between on & off state enables short pulse, which adds fast switching frequency needed for reliable operation. As IGCT performs better at higher temperature, it can operate at a temperature ranges from -40 to 125 C. IGCT is used in industrial appliances and steel mills to control high power AC motors, and AC grid interface, as well as the PWM switching. Therefore, this feature boosts the growth of the IGCT market. The production process of IGCT consumes time due to its complex design. The structure consists of a number of small-sized components measuring within a range of millimeters, which further increases the complexity of the component. Furthermore, the fabrication process consisting of drilling, etching, and programming of minute components is also a complex and time consuming process. Hence, it restricts the adoption of the IGCT market. This study comprises analytical depiction of the global IGCT market with current trends and future estimations to depict the imminent investment pockets. 3.5.1.1. Low conduction loss as compared to GTO and IGBT. 3.5.1.2. Increased usage of power electronics in renewable energy sources. 3.5.1.3. Better performance at higher temperature. 3.5.2.1. Bulky thyristor structure and complex manufacturing process. 3.5.3.1. Use of semiconductor devices in hybrid vehicles. 3.5.3.2. Invention of high power technology (HPT) platform. 7.4. TIANJIN CENTURY ELECTRONICS CO., LTD.
7.7. XIAMEN HIDINS TECHNOLOGY CO., LTD.
7.9. SHENZHEN CTW SEMICONDUCTOR CO., LTD.
7.10. JIANGYIN CITY SAIYING ELECTRON CO., LTD. Integrated Gate Commutated Thyristor (IGCT) is a power semiconductor, which can be used for medium to high-voltage applications ranging from 0.5 MVA up to several 100 MVA. At present, there is an increase in demand for the IGCT devices from the developed countries such as the U.S, Canada, and others. Companies in this industry adopt various techniques to provide customers with advanced and innovative product offerings. Benefits such as better performance of IGCT at higher temperature (temperature ranges from -40 to 125 °C) support the growth of the market. IGCT is used in industrial appliances and steel mills to control high power AC motors and AC grid interface, as well as the PWM switching. Therefore, this feature adds value to drive the IGCT market. However, bulky structure of the thyristor and complex manufacturing process impede the growth of the market. In future, rise in use of power semiconductor devices in hybrid vehicles, and invention of high-power technology (HPT) platform are expected to create lucrative opportunities for the key players operating in the IGCT market. Among the analyzed geographical regions, Asia-Pacific is expected to account for the highest revenue in the global market throughout the forecast period (2018-2024) followed by North America, Europe, and LAMEA. However, LAMEA is projected to grow at a higher CAGR, predicting a lucrative market growth for IGCT devices. ABB, Infineon Technologies, Mitsubishi Electric, Tianjin Century Electronics, CSR Zhuzhou Institute Co, Ltd. (CRRC), General Electric, Xiamen Hidins Technology Co. Ltd., Jiangyin City Saiying Electron Co. Ltd., AmePower, Inc., and Shenzhen CTW Semiconductor Co., Ltd are the key market players that occupy a significant revenue share in the IGCT market.